Conveyor belts are manufactured in sections with specified lengths. These sections are then joined together so as to ensure the highest possible tensile strength. Hence, the issue of durability and reliability of conveyor belt joints is one of the key operational problems in continuous transport. Jointing materials and technologies are selected to match the belt’s core type and materials. Belts with steel cable cores are bonded by hot vulcanization only. Fabric-rubber multi-ply belts can be bonded by hot vulcanization, gluing or with mechanical fasteners. Hot vulcanization is used to bond all types of belts. FTT Wolbrom SA recommends hot vulcanization as the optimal technique for bonding their products. These bonds are made with a vulcanizing press at temperatures ca. 145–155°C and pressures of at least 0.8 MPa. The joint, when prepared, should be protected from adverse external impacts, i.e. humidity and dust. A typical vulcanized joint is made up of the belt’s cover and core rubber mixture and appropriately selected single-agent polymer adhesive subjected to heat and pressure during the vulcanization process. Materials used for belt jointing should always be selected by the manufacturer. 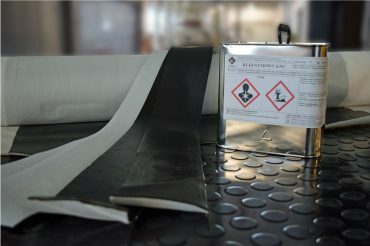 FTT Wolbrom SA’s professional kits for fabric-rubber belt vulcanized bonding are listed in the DATA SHEET. FTT Wolbrom SA’s jointing products warrant the belt joint’s highest achievable strength, even beyond 80% of the belt’s nominal strength.